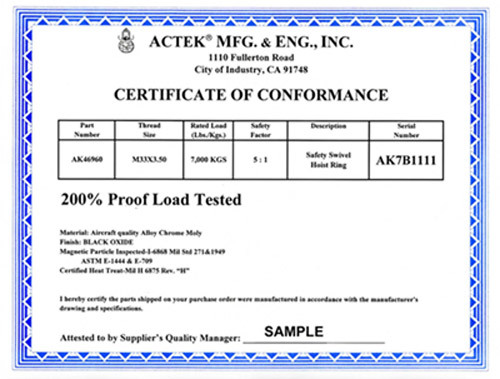 Hoist Ring & Eyebolt Frequently Asked Questions (FAQ) - City of Industry, California - Actek Manufacturing & Engineering, Inc.
Q: Can I get a hoist ring with a shorter or longer bolt length? A: Definitely! Most of our hoist rings can be supplied with either a shorter or longer bolt length. Contact us for a quotation and delivery time. Q: Can I get a hoist ring with other thread types (fine, NPT, coil, acme...)? A: Sure! We stock most fine thread sizes, and can get other thread types as well. Contact us for more information. Q: I'm currently using eyebolts for my lifting application. Why should I use hoist rings instead? A: See Hoist Ring vs. Eyebolt (PDF - 192 KB). Q: Do you have any hoist rings that offer corrosion resistance? A: Yes, we offer stainless steel hoist ring. We also have alloy hoist rings that can be electroless nickel plated, cadmium plated and zinc plated. Q: Do you proof-load test your hoist rings? A: Yes, our hoist rings are proof-load tested, serial numbered, and come with certification. Q: Can you custom design a hoist ring to meet a specific application? A: Yes, we can customize or design a hoist ring to meet your specific needs. Contact us for a quotation and delivery time. Q: Safe working temperature? A: Typically, the safe working temperature for most of our hoist rings is -20 degrees to 800 degrees F. Please Contact us if outside this range. Q: Can I get a catalog? A: Absolutely, click here for our online catalog navigator or Contact us for a printed version.